[Tip] How to Get Code for Move to iOS - iMobie Inc.
How to make transfer to iOS quickly? And how to get the move to iOS code easily? Just read this detailed post to get the answer. Get this powerful Android to iOS data transfer tool to transfer photos, contacts, music, videos from Android to iPhone/iPad quickly. What is Move to iOS? Move to iOS is a free app using to move data from Android to iOS devices. If you have no idea of how to use Move to iOS and get code for move to iOS, then keep reading, you will find answers in this step-by-step tutorial. Step 1. On your iOS device, tap the Move Data from Android while you setting up it. On your Android phone, Open Move to iOS app and tap continue, on Find Your Code screen, tap Next. Step 2. On your iOS device, tap Continue and wait for a ten-digit or six-digit code to appear. Step 3. On your Android phone, enter the code you just received on the iOS device. Wait for the two devices connected and then select the data you want to move tap Next. Step 4. On your Android phone, tap Done when the loading bar finishes on your iOS device. Then follow the onscreen steps to set up your iOS device. Note: Before you start moving to iOS, you should make sure your iOS device is running iOS 9 or later, Android version is 4.0 or later and both of them have enough power. 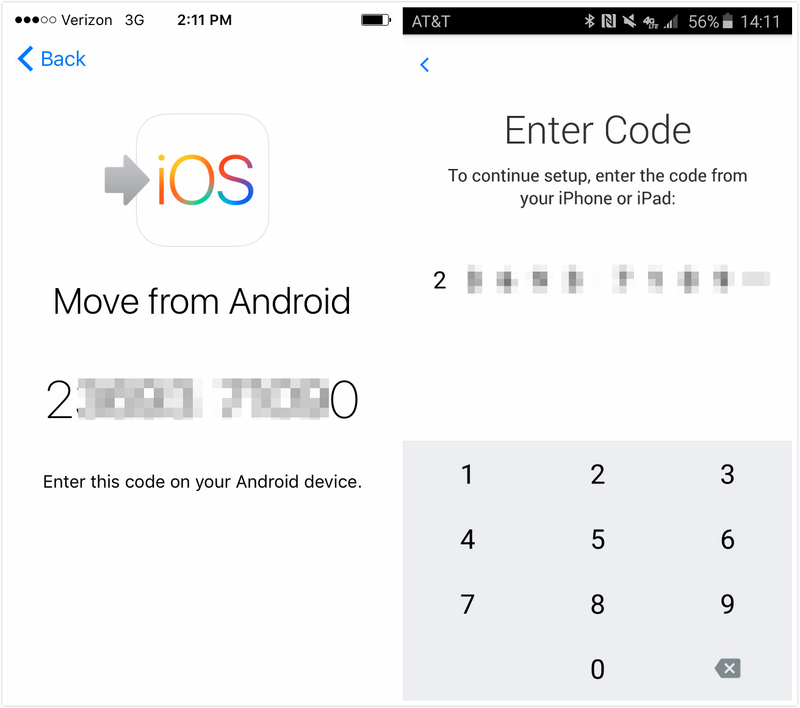 As is shown above, it is not hard to get code for Move to iOS and transfer data from Android to iOS. However, according to some people who tried Move to iOS app, they get no code for Move to iOS! If that's what you are encountering, please don't worry, here in this bonus tip part, we will introduce you a powerful tool capable of helping you transfer data from Android to iOS with no effort. - No Restrictions on Device. As is known to all, Move to iOS app requires devices that are running iOS 9 or later or Android version 4.0 or later. This Move to iOS alternative tool could help you transfer data like contacts, videos, messages, photos from any Android phone to any iOS device without any restrictions. - No Data Missing. While transferring data from Android to iOS with Move to iOS app, contacts are always missed. This powerful data transfer tool always transfers all your data without no data missing. - High Security. This powerful tool is developed by Apple-trusted developer, so there is no potential of information leakage. - High Transfer Speed. This phone data transfer tool saves you lots of time. Within 5 minutes, a few gigabytes of data could be transferred from Android to iPhone. That's all for how to get move to iOS code and an excellent Move to iOS app alternative tool. Hope this article solves your problem. Frankly, there are actually many issues you may encounter while using Move to iOS app, like Move to iOS slow, Move to iOS WiFi drops, Move to iOS interrupted, please refer to other posts to get fixes. By the way, what do you think of Move to iOS app, share your ideas with others in the comment column.